After winning the opening stage of the 2015 Dakar on Sunday, Brit Sam Sunderland was brought back to earth with a bump when he got lost just before way point 12 of the second stage. Having been a front runner throughout the monster 311 mile timed special, the factory KTM rider looked odds on to secure a strong podium finish but instead slumped to 72nd place at the end of the tough stage. Despite his experience he was unable to correct his mistake quickly and ended up getting badly lost before managing to get his race back on track. His error cost him dearly and meant that he has gone from leading the race by five seconds to being over 2 hours 25m 40s behind new leader Joan Barreda in the overall standings. It was also a disappointing day for Sunderland’s KTM team-mate Marc Coma who like Sunderland was well in contention for another podium finish until a rear tyre problem left him nursing his KTM in the final miles of the stage limiting himself to just 40mph. His drop in pace saw him lose over 12 minutes to Barreda and drop to sixth overall. Barreda himself rode brilliantly to win the stage and given his incredible pace throughout the 321 mile timed special it’s unlikely that either Sunderland or Coma would have had an answer to the Spaniard even if they hadn’t had problems. 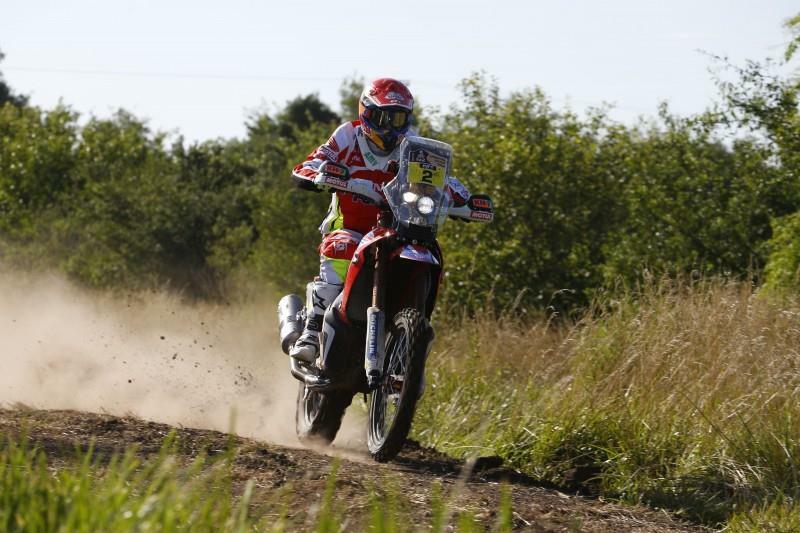 Barreda now leads by 6m 44s from HRC team-mate Paolo Goncalves. He said: "I am really happy. Today was amazing. It was really hard, really tough in the last part of special with a lot of tracks and a lot of bumps and it was so physical. But today was one of these days where it is important to get to the finish and we've got here so we are really happy. I was alone in some parts, but the most important was to remain calm over the first kilometres and finally we did a really good job. I think it's a good opportunity for victory but the race is really close, so if we can perform like today and gain some minutes and seconds, then it's very important”. “Today was a really, really long and hard stage. It was more than 500 km but with really difficult tracks, a lot of rocks and a last 45 km that was amazing. There was some super grass and a section with sand. With this temperature it was really, really hard, but I'm happy to be here. In the middle of the stage I lost a little bit of time trying to find a way point. I lost the others and for the last 200 km I was on my own, but I'm happy for me, for HRC and especially for Joan, because he rode a really, really, really, really smart race today. He just started pushing after 350 km, so congratulations to Joan. I thought we were very brave today because it was a really difficult day. This was a really typical Dakar stage; it wasn't a normal Dakar stage, but one with a high amount of difficulty”. British interest was maintained by Simon and Llewelyn Pavey who both rode an impressive stage two to move up the leaderboard. Simon is now in 80th spot with Llewelyn 81st in the overall standings. Midwest Racing Husqvarna rider Chris Cork is currently not listed in the overall standings, possibly due to the stage being shortened following an accident between a rider and a car, but is believed to still be in the race.